In February, four Holy Family Service Corps (HFSC) volunteers along with Lynn Guerra, Volunteer Program Director, spent several days at the Sisters of the Holy Family of Nazareth’s provincialate in Des Plaines, IL. The retreat gave the volunteers an opportunity to immerse themselves in the charism and mission of the Sisters and to share in the prayer life of the Congregation. 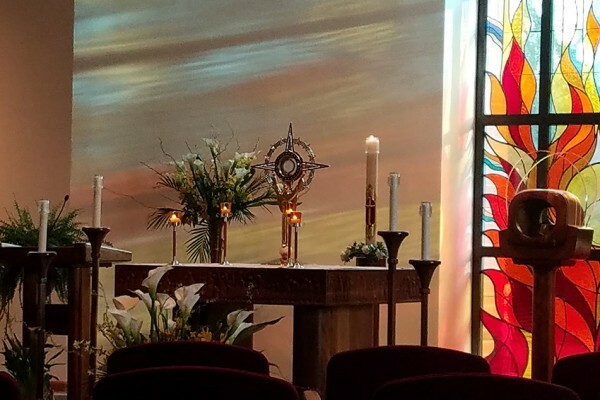 Inspired by this experience, Liz Fairchild, one of the volunteers, composed this reflection about deepening her prayer life through adoration with the Sisters. This year was the first time I had gone to adoration in a long time. It was a bit unnerving going into the chapel for adoration surrounded by sisters who, in my eyes, were probably much better at it then I was. The fact is sisters and others in religious life spend a lot of time developing their prayer life. It probably wasn’t fair to try to compare myself to them. As I began the hour of adoration, I started out with simple prayers that I had heard several times. After only a few minutes, I began to get a bit distracted thinking about the day’s events. I tried again to focus on the prayers that I could recall from Sunday Mass, but every prayer I said felt a bit too rehearsed. It bothered me that all the prayers I knew by heart felt too rehearsed. What was I supposed to do: think of a prayer off the top of my head? I didn’t think I was ready for that, but I tried. I closed my eyes clearing my head and began to talk to God, throwing formality to the wind and telling God everything I was feeling. After pouring out all my thoughts and feelings, I took time to reflect and found a sense of peace. Over the course of a few days, I returned to adoration a few more times. Each time I went, it became easier for me to open up and talk to God. It has been a few months since my return to adoration. Since that time, adoration has become a regular part of my Sunday. I am still learning, but have found the process of communicating with God through prayer during adoration less of a challenge than I had anticipated in the beginning. If I could offer a young Catholic one piece of advice about adoration, it would be just talk to Him and don’t worry about how it sounds in your head. The Sisters of the Holy Family of Nazareth along with the Holy Family Institute invite young adults, age 21 to 35, to serve those in need by volunteering for the Holy Family Service Corps (HFSC). This one-year program allows volunteers an opportunity to earn an education grant at the conclusion of their service in addition to providing support for living expenses during the service year. Holy Family Service Corps offers a unique combination of simple communal living, service and faith-building opportunities with Sisters of the Holy Family of Nazareth serving as "Sister-Companions" to the volunteers. Applications are now being accepted. To learn more, visit https://nazarethcsfn.org/service-corps.